The network of Selwo parks in the province of Malaga (Selwo Marina in Benalmadena and Selwo Adventure in Estepona) and the Cable Car in Benalmadena inaugurate tomorrow the season of 2010 and open their doors to new improvements where nature and leisure are the protagonists. Besides the usual attractions of these leisure parks there have taken place recent enhancements with new tropical forest species, boreal lynxes and birds of prey. Moreover, there have been expanded and renovated several spaces, including those reserved for the Australian ‘wallabies’ or the arctic wolves. The complementary offer both in Selwo Marina Benalmadena as in Selwo Adventure Estepona includes exhibitions, guided tours or programs to learn about the various species. These recreational parks, which combine nature and learning with enjoyment for the whole family, received in 2009 about 550.000 visits, of which the majority went to enjoy the facilities in Benalmadena devoted to the marine world. 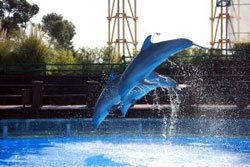 In Selwo Marina, with the only Dolphinarium and Ice Penguinarium of Andalusia offers this season new exhibits of dolphins and sea lions. Similarly, in order to interact with the species, there has been designed a program to get up close to them. The cable car, meanwhile, offers a tour which unites Benalmadena Costa and the summit of Mount Calamorro, some 800 meters above sea level, and the possibility to enjoy a varied offer, such as exhibits of birds of prey, marked routes or the observatory.